In my last post of 2012, “The Year in Review,” fellow author and blogger Janna Hill commented that 2012 was a journey for her because it was her first year as an indie author. You know me, I’m always interested in hearing about someone else’s path. I immediately asked her if she’d share her story with me (and you). Despite being sick with the flu, she took a few minutes to answer some questions about her road to independent publishing. You’re blog’s main focus is photography. Can you talk about how you became a writer? Whew! I thought you were going to ask me to talk about photography. How I became a writer requires digging into the memory archives. Let’s see… like most writers I have always written although I was probably 22 years old before I wrote anything for the ‘public’ eye. My debut came as a spoof; an unsolicited parody I had written of (yes of not for) the hospital newsletter. My coworkers were amused and my supervisor told me I had missed my calling. That moment in time mingled with the encouragement of my aunt, my mother and a few others who encouraged me to venture into the world of writing. After winning a few minor contests and several honorable mentions in essays, short stories and poetry, I started submitting on-topic articles to various magazines and newspapers. Somewhere along the way I became a ghostwriter. Ghostwriting served me well for many years, mainly because I lacked self-confidence and courage. When I reached the age of 50, I had an epiphany and I called myself a writer. Getting older has its rewards. Can you briefly explain what “indie publishing” is for my novice readers? Sure. Indie is short for independent. Being an indie author, an indie publisher, or both pretty much just means you are on your own. It’s your baby and you are a single parent. I saw on your website that you have several titles published already. When did you decide to stop publishing the traditional way and go the indie route? I wrestled with the notion throughout 2011; by January 2012 it was decided. For a number of reasons. The support system in traditional publishing is not what it once was. Authors are expected to do more and receive less. Those reasons, coupled with the fact that most of my work was to someone else’s credit; I was tired of being a ghost and realized the break I was waiting for was going to break me. I was waiting for a bus that would never come. How does the indie path differ from the traditional path? The traditional path offers you a sense of stability; editing and design come stamped with a recognized seal. Indie means you will have to hire out any service you can’t do for yourself and you’re an unknown brand. People are leery of unknown brands. In what ways was your indie path better? It has given me the freedom to be me. In what ways was it harder? In every way imaginable. Finding (and keeping) a quality editor/proofreader/critique panel was a real challenge. Is there anything that you’d do differently now that you have some experience under your belt? Yes. I think I would’ve transitioned a little slower and maybe (just maybe) held my tongue a little tighter. Can you offer any advice to aspiring or established authors regarding indie publishing? Be ready to hit the ground running and have all of your ducks in a row. Don’t be overanxious. To paraphrase my favorite editor: “A bad reputation is harder to recover from than no reputation at all.” And lastly, when you’re certain that your product is ready for market, have your marketing strategy ready before its release. A giant, heartfelt thanks goes out to Janna, who took the time to answer these questions, without the promised refreshments. The next time you’re in my neck of the woods, Janna, dinner and drinks are on me. 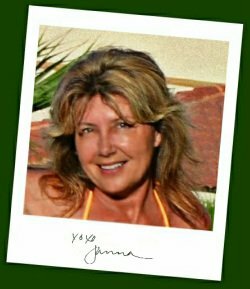 Janna is a wife, mother and grandmother born and raised in Texas where she still happily resides. She’s a licensed nurse and now calls herself an independent author—she writes adult literary fiction and poetry. Her characters are usually from the south because that’s where her heart resides. Her photography and blog can be found at http://jannahill.wordpress.com/, and her website, http://www.jannahill.net/, has links to all her published works. I encourage you to check them out. Thanks for pointing that out. I’ll look into it and hopefully have a solution to the problem soon. Wow! She is an inspiration to us all. She followed her talent and her heart with courage and faith. Just beautiful! It does take a pretty special person to make such a special journey. I hope she sees your reply and realizes she reached you with her story. Thanks for your comment. I agree with Janna. 2012 was also my year to become an indie writer. I haven’t regretted it, but I’ve learned a million little things I’m trying to apply to the launch of my second ebook. And from this experience, I’m sure I’ll learn even more for my next release later this year. Thanks for posting, Staci. I’d love to hear how your journey compared to hers. It’s a fascinating industry, isn’t it? Good luck with book 2! I’ll write about it soon. Still challenged with typing. It was huge that I got out a post yesterday on January gardening – one step at a time. Can’t wait to read about it. I had hoped you were feeling better when I read your gardening post (you guys are always ahead of the game). I’ll keep you in my prayers! Thanks. I’m getting up every day determined to something productive. When interactions turn into interviews. If you don’t already know Staci I’d like to introduce her. She is an Italian weight lifter with a Master’s Degree in writing but don’t let that scare you.